Sharmini Peries: The Dow Jones trading took a deep drive this week, dropping over 1,000 points in the first 20 minutes of trading. It is now slowly reversing itself, but it was the greatest loss in trading since the 2010 crash. Here to discuss all of this, we’re joined by Michael Hudson. Michael Hudson is a distinguished research professor of economics at the University of Missouri, Kansas City. 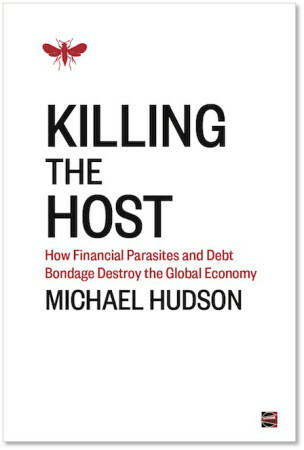 His latest book, which we promise to unpack in detail very soon, is Killing the Host: How Financial Parasites and Debt Destroy Global Economy. You can get a digital download of it at CounterPunch. Michael, thank you so much for joining us. Michael Hudson: Good to be here. And the hard print will be out in another two weeks from Amazon. Peries: Look forward to it, Michael. So Michael, some mainstream news outlets are saying that this is the China contagion. They need someone to blame. What’s causing all of this? Hudson: Not China. China’s simply back to the level that it was earlier in the year. One of the problems with the Chinese market that is quite different from the American and European market is that a lot of the big Chinese banks have lent to small lenders, sort of small wholesale lenders, that in turn have lent to retail people. And a lot of Chinese are trying to get ahead by borrowing money to buy real estate or to buy stocks. So there are these intermediaries, these non-bank intermediaries, sort of like real estate brokers, who borrowed big money from banks and lent it out to a lot of little people. And once the small people got in it’s like odd lot traders in the United States, small traders, you know that the boom is over. What you’re having now is a lot of small speculators have lost their money. And that’s put the squeeze on the non-bank speculators. But that’s something almost unique in China. Most Americans and most European families don’t borrow to go into the market. Most of the market is indeed funded by debt, but it’s funded by bank lending and huge, huge leverage borrowings for all of this. This is what most of the commentators don’t get. All this market run-up we’ve seen in the last year or two has been by the Federal Reserve making credit available to banks at about one-tenth of 1 percent. The banks have lent to big institutional traders and speculators thinking, well gee, if we can borrow at 1 percent and buy stocks that yield maybe 5 or 6 percent, then we can make the arbitrage. So they’ve made a 5 percent arbitrage by buying, but they’ve also now lost 10 percent, maybe 20 percent on the capital. What we’re seeing is that short-term thinking really hasn’t taken into account the long run. And that’s why this is very much like the Long-Term Capital Management crash in 1997, when the two Nobel prize winners who calculated how the economy works and lives in the short term found out that all of a sudden the short term has to come back to the long term. percent of the people are so busy paying off their debt that what is counted as savings here is just paying down the debt. That’s why they don’t have enough money to buy goods and services, and so sales are falling. That means that profits are falling. And people finally realized that wait a minute, with companies not making more profits they’re not going to be able to pay the dividends. Well, companies themselves have been causing this crisis as much as speculators, because companies like Amazon, like Google, or Apple especially, have been borrowing money to buy their own stock. Corporate activists, stockholder activists, have told these companies, we want you to put us on the board because we want you to borrow at 1 percent to buy your stock yielding 5 percent. You’ll get rich in no time. So these stock buybacks by Apple and by other companies at high prices can push up their stock price in the short term. But when prices crash, their net worth is all of a sudden plunging. And so we’re in a classic debt deflation. Hudson: Well, what they cause is the runup–companies are under pressure. The managers are paid according to how well they can make a stock price go up. And they think, why should we invest in long-term research and development or long-term developments when we can use the earnings we have just to buy our own stock, and that’ll push them up even without investing, without hiring, without producing more. We can make the stock go up by financial engineering. By using our earnings to buy [their own] stock. So what you have is empty earnings. You’ve had stock prices going up without corporate earnings really going up. If you buy back your stock and you retire the shares, then earnings per shares go up. But all of a sudden the whole world realizes that this is all financial engineering, doing it with mirrors, and it’s not real. There’s been no real gain in industrial profitability. There’s just been a diversion of corporate income into the financial markets instead of tangible new investment in hiring. Peries: Michael, Lawrence Summers is tweeting, he writes, as in August 1997, 1998, 2007 and 2008, we could be in the early stages of a very serious situation, which I think we can attribute some of the blame to him. What do you make of that comment, and is that so? Is this the beginnings of a bigger problem? Hudson: I wish he would have said what he means by ‘situation’. What people don’t realize usually, and especially what Lawrence Summers doesn’t realize, is that there are two economies. When he means a bad situation, that means for his constituency. The 1 percent. The 1 percent think oh, we’re going to be losing in the asset markets. But the 1 percent has been making money by getting the 99 percent into debt. By squeezing more work out of them. By keeping wages low and by starving the market so that there’s nobody to buy the goods that they produce. So the problem is in the real economy, not the financial economy. But Lawrence Summers and the Federal Reserve all of a sudden say look, we don’t care about the real economy. We care about the stock market. And what you’ve seen in the last few years, two years I’d say, of the stock runup, is something unique. For the first time the central banks of America, even Switzerland and Europe, are talking about the role of the central bank is to inflate asset prices. Well, the traditional reason for central banks that they gave is to stop inflation. And yet now they’re trying to inflate the stock market. The Federal Reserve has been trying to push up the stock market purely by financial engineering, by making this low interest rate and quantitative easing. The Wall Street Journal gets it wrong, too, on its editorial page. You have an op-ed by Gerald O’Driscoll, who used to be on the board of the Dallas Federal Reserve, saying gee, the problem with low interest rates is it encourages long-term investment because people can take their time. Well, that’s crazy Austrian theory. The real problem is that low interest rates provide money to short-term speculators. All this credit has been used not for the long term, not for investment at all, but just speculation. And when you have speculation, a little bit of a drop in the market can wipe out all of the capital that’s invested. So what you had this morning in the stock market was a huge wipeout of borrowed money on which people thought the market would go up, and the Federal Reserve would be able to inflate prices. The job of the Federal Reserve is to increase the price of wealth and stocks and real estate relative to labor. The Federal Reserve is sort of waging class war. It wants to increase the assets of the 1 percent relative to the earnings of the 99 percent, and we’re seeing the fact that this, the effect of this class war is so successful it’s plunged the economy into debt, slowed the economy, and led to the crisis we have today. Peries: Michael, just one last question. Most ordinary people are sitting back saying well, it’s a stock market crash. I don’t have anything in the market. And so I don’t have to really worry about it. What do you say to them, and how are they going to feel the impact of this? Hudson: It’s not going to affect them all that much. The fact is that so much of the money in the market was speculative capital that it really isn’t going to affect them much. And it certainly isn’t going to affect China all that much. China is trying to develop an internal market. It has other problems, and the market is not going to affect either China’s economy or this. But when the 1 percent lose money, they scream like anything, and they say it’s the job of the 99 percent to bail them out. Peries: What about your retirement savings, and so on? Hudson: Well, if the savings are invested in the stock market in speculative hedge funds they’d lose, but very few savings are. The savings have already gone way, way up from the market. And the market is only down to what it was earlier this year. So the people have not really suffered very much at all. They’ve only not made as big of gains as they would have hoped for, but they’re not affected.